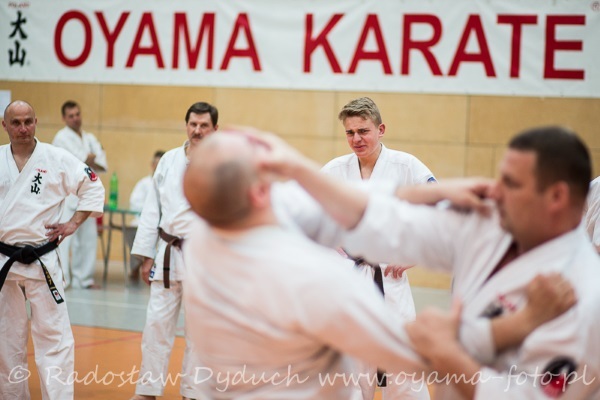 Krakow hosted an All Polish Oyama Karate Seminar focusing on kumite, self-defense and refereeing in Knockdown. During an one day schooling around 120 participants including chief of clubs, instructors, referees and fighters from Poland mastered new techniques and exercises. Meeting was subsidized by the city of Krakow, OSU! The main part of the seminar focusing on Knockdown was conducted by– Hanshi Jan Dyduch 8th dan and Shihan Rafal Majda 5th dan. During two trainings they have shown methods and exercises for distance and half distance fighting. Shihan Pawel Pajdak 5th dan and Shihan Witold Choiński 5th dan conducted a lecture for the referees. During the workshop numerous cases for referees were considered and studied. Lastly, Shihan Andrzej Pierzchala 6th dan – director for schooling in OYAMA IKF conducted a dynamic training with elements of utilitarian fighting. During the seminar Hanshi Jan Dyduch- Chairman of OYAMA PKF handed the trophies for the laureate of the Polish OYAMA Karate Ranking in 2014, OSU!. WE WOULD LIKE TO THANK ALL THE PARTICIPANTS OF THE SEMINAR FOR THEIR ACTIVE PRESENCE AND FRUITFULL COOPERATION, OSU!